Lisa joined Great Falls Artist Thomas English on a seven day art adventure in early July 2004 into the Bob Marshall Wilderness to experience the dramatic Flathead National Forest landscape and capture it on canvas. This unique educational trip immersed participants into Montana's unmatched scenery with an artistic focus. The adventure began at the Triple J Wilderness Ranch in Augusta, Montana, nestled 5,500 feet on the Rocky Mountain Front Range. Experienced outfitters led the group on horseback into the "Bob", providing all the necessary equipment and meal preparation. 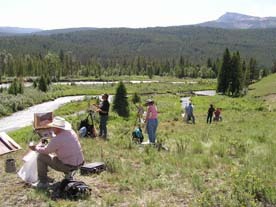 The group stopped throughout the pack trip to pull out easels and paints for spontaneous and breathtaking views and painting instruction.